If you’re really using Evernote to “remember everything,” you know that you need to be diligent in getting your stuff into Evernote. There are a few built-in features to speed-up the process: a dedicated e-mail addressing for sending items to Evernote or import folders that Evernote where you can save files for automatic import. As well, there are apps that tie into Evernote from smartphones and tablets, making it easier to add content for those devices. However, beyond those considerations, there is nothing in the way of native support for automating Evernote. Kosio Angelov addresses this “shortcoming” in his ebook, How to Automate Evernote: Put Evernote on Autopilot, Save Boat Loads of Time and Make Your Life Easier (and More Organized)! (aff link) A mouthful of a title. In the 77 page book, Kosio looks at a couple of tools that can work with Evernote to automate a number of processes: IFTTT, Gmail, Zapier and Evernote’s built-in features. He takes us through each of the tools in step-by-step detail, offering a few concrete examples form each tool – recipes from IFTTT, zaps from Zapier, and setting up the built-in automation processes. 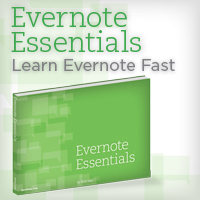 If you’re looking for a way to take your Evernote experience to the next level, this ebook is the way to go. It’s $7.00, a good investment for improving your productivity processes. How to Automate Evernote: Put Evernote on Autopilot, Save Boat Loads of Time and Make Your Life Easier (and More Organized)!